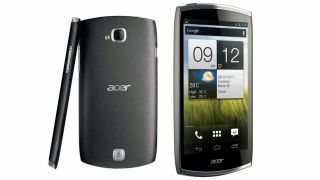 Acer's CloudMobile S500 smartphone, unveiled way back at MWC in February, has finally gone on sale in the UK. The 4.3-inch Android Ice Cream Sandwich handset is now in stock at online retailer Expansys for the rather modest SIM-free price of £290. The device, initially slated for launch by the store on September 5, features a 1280 x 720 HD IPS display, a 1.5GHz dual-core processor, 1GB RAM, and 8GB of on-board storage. There's also an 8-megapixel camera on board, capable of shooting full HD video. The device is somewhat skewed towards business users as the AcerCloud app makes it easier to sync-up their data with other Acer devices, like a laptop or tablet. The 9mm thick device seemed like a solid mid-range player when it was announced over 7 months ago in Barcelona. Does it still have what it takes to match up with the competition?